This story lends itself to multiple engineering aspects, and a few are listed below. The level at which a teacher develops this within the classroom will, obviously, depend on the age and ability of the students. The student's first task would usually be identifying a need. There are a few suggestions for this, or students may list their own based on what they notice in the story. The examples below are just samples of needs that the children may identify. • How would the bears know when someone was in their house? Design an alarm system that would help them with this. • How could Baby Bear's chair be made stronger? Compare and contrast various illustrations and decide which shape it was. Identify whether it was a 3 legged stool or a 4 legged chair. (Can carry out the 3 legged design activities to discuss stability issues). 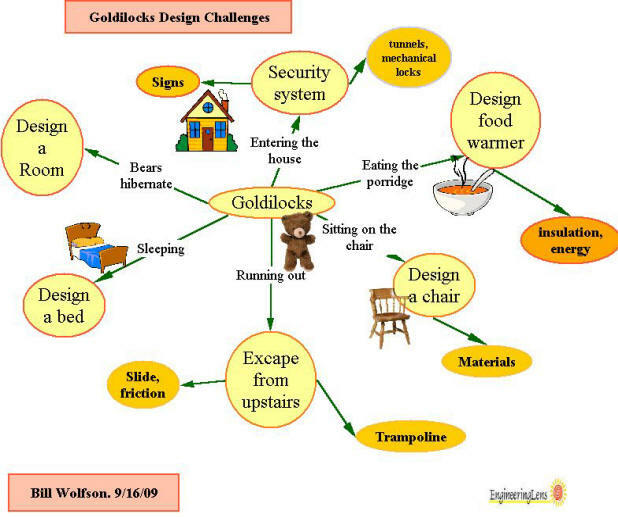 As Bears hibernate, design a room in the house for the bears to use.